Time to get on the guilt train, readers, and ask ourselves how we got to work this morning… or school, or the shops, or the somewhere else we had to be. If you got in on foot, you’re off the hook. By bus or bicycle? That’s fine too. See, it’s Car Free Day today, an international event set up on September 22nd to encourage us to get around without cars. Good cause too, cos nowhere feels more filled to the gills with the gleaming demons than our planet as of now. OK. For those that took Car Free Day as an excuse to get the boss to let them work from home “for the environment’s sake” and have been surfing TV from the sofa since sunrise, that’s not the point. The thing is to persuade people they can get to places without the four-wheeled frenemy. Walking is about as evangelical as it gets (no on-water stunts required), but carpool and commuter rail are almost as good. Plumbers and pizza deliverers can even go in for a bit of vanpooling I hear: it’s just about reducing those emissions on the road. I’m imagining what no cars will look like on the DC-scape, a city soaked in so many roads friendly only for auto. And to think it wasn’t that long ago that the car was but a buzz in some brilliant man’s mind, and the only blots being made by transportation on the environment were steaming horse pats and engine steam. 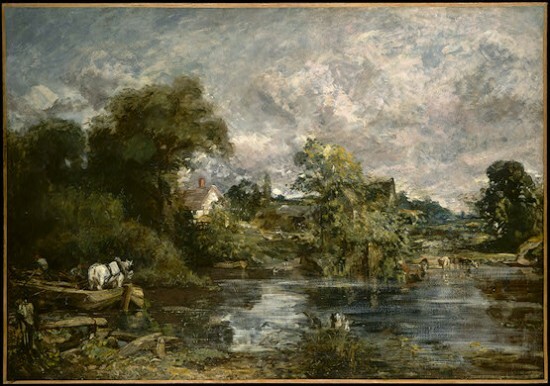 Here to lend substance to that fazed-out, hazed-out and not-so-distant past, when a barge or a beast were just some of the ways to go, is British painter John Constable (1776 – 1837) with his White Horse (188-1819). 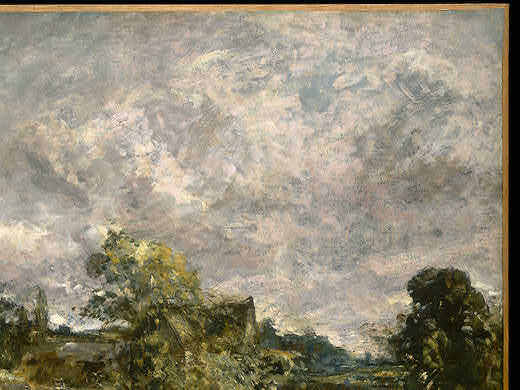 Constable is the one regarded as England’s finest landscape painter, though people at his time poo-pooed his choice of subject matter. For far from taking himself off to depict dramatic mountains (good luck finding many of those in England, anyway) or sweeping panoramas, he homed in on a working countryside of activity, animals and authenticity. I’m not sure whether this is a finished work, but I believe it to be (since Constable’s critics condemned his pictures for looking unfinished). The thing is, the way he’s left it, all edgy and eddying color on the canvas, is exactly what I like about it: it’s so jazzy and jaunty, and feels fresh with vim and vigor. This kind of imprecision is just the way to capture the precise sensations created by nature: the dark dampness at the water’s edge, the glossy lushness of green tree canopies, the wild wetness of clouds skimming overhead. 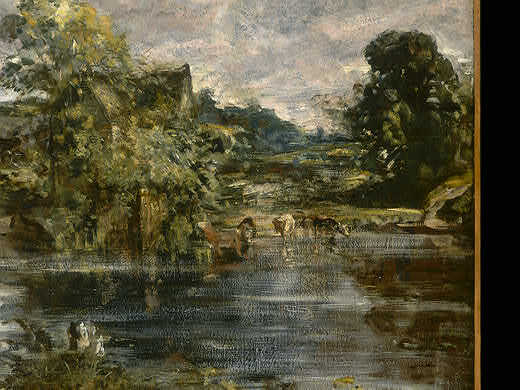 Ooh Constable is like a slap in the face with a fresh fish, a total enticement into the bosom of nature. And it’s a bosom overflowing with delicious details of charming country life. Two men maneuver the barge with that gloriously-rumped horse standing inside. In the middle ground cows amble idly knee-deep into the water. In the distance nestles a cosy-looking cottage with a gabled roof and tooting chimney. All things whipped in with the most deft and dextrous hand. 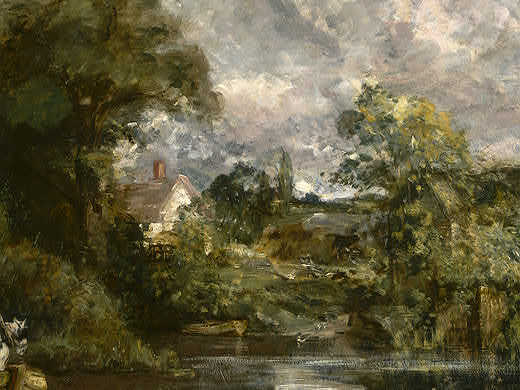 Nature is where we find the heart of this artist who said one time “No two days are alike, nor even two hours; neither was there ever two leaves of tree alike since the creation of the world.” I bet if he were alive today, Constable wouldn’t even own a car, much less drive one. 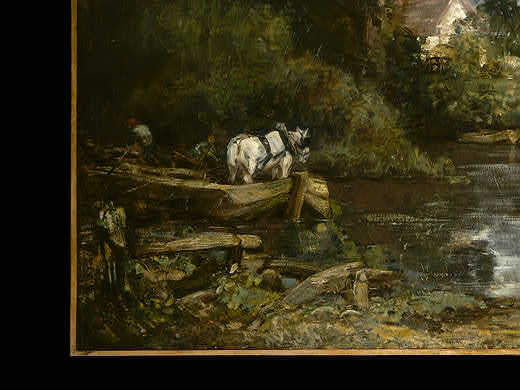 Constable is one of my favorite artists, mostly because he painted HUGE pictures as rough copies and then repainted the final version (also HUGE). A couple years back the National Gallery got a huge collection of his together and displayed the paintings next to their “rough” drafts. One of the best exhibits at the NGA I’ve seen. This is the first of the full sized sketches he made in preparation for his larger works. The “finished” version of this painting is in the Frick Collection in NYC.